Anyone with the slightest knowledge of antiques cannot be unaware of Art Deco and will have at least a passing idea of what it looked like in terms of the objects it was responsible for producing. It is broadly agreed that it spanned the years between the two World Wars, although as always there were individuals that laid the foundations for the look and feel of Art Deco. One has to take into account Picasso's Cubism, the striking designs of Christopher Dresser that seemed well ahead of their time and the establishment of the Wiener Werkstatte that integrated art and purposeful design into household objects. The movement was both American and European, but was perhaps centred on the 1925 Paris Exposition Internationale des Arts Decoratifs et Industriels Modernes, hence the shorthand 'Art Deco'. As the name suggests, a number of strings were drawn together to create a total style that could incorporate art and design into the grand and the everyday. Consider the Empire State building or indeed a humble piece of ceramic – high art and low art co-existing comfortably together. 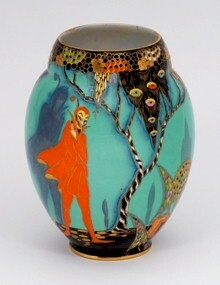 A Carlton Ware Mephistopheles pattern vase. British tastes were not as adventurous as those on the Continent. Domestic Art Deco ceramics, unlike that of the French (which was more elitist), were largely populist - the type of thing one might buy in the High Street rather than the gallery. It became a sort of British folk art for the machine age, although Art Deco did also draw together eclectic strands from the neo classical, Asian and Egyptian spheres – the latter stimulated by the opening of Tutankhamen tomb in 1922. When considering ceramics, Clarice Cliff has primacy in most people minds, although the supporting cast is a strong and varied one. Perhaps, in volume terms, Susie Cooper is foremost having produced over 4,000 commercial designs for Grays. Initially favouring bright and often abstract hand-painted, she switched to lithographed decoration with little or no loss of appeal. The kestrel shaped tea and tableware being her 'signature dish'. 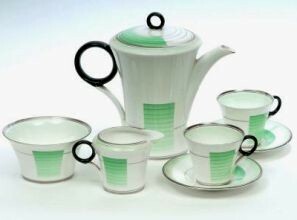 A Shelley Regent shaped coffee service, circa 1933. Close on her heels in volume terms must be Shelley. Whilst Shelley produced some painted wares, primarily the Harmony Dripware, it too favoured printed decoration, but perhaps reflected what a broad church Art Deco was. Using everything from the Geometric to the popular Tall Trees and Sunshine, Yellow Butterfly or Crocus (wonder where they got that idea from) in trendy sounding shapes like Vogue and Mode and the not so trendy Queen Anne. Also with help from Mabel Lucie Attwell, they produced a range of playful Boo Boo nursery figures – though I suspect grown ups bought and kept most of them. A Charlotte Rhead for Crown Ducal Persian Rose pattern vase. 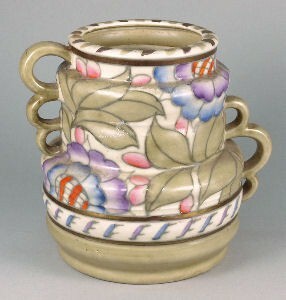 Charlotte Rhead came from a dynasty of potters, illustrators and designers and worked variously for Wood & Sons, Bursley Ltd, Burgess & Leigh, especially AG Richardson on their Crown Ducal range specialising in tubelined work, initially on tiles and then latterly on bowls, plates and jugs with a bias towards flowers, fruit and foliage often with an eastern feel to them. Meantime, Wiltshaw & Robinson's Carlton Ware certainly took the Egyptian and the fabulous facet of Art Deco to heart and coupled it with very sophisticated lithographs, sumptuous colouring and gilding to very luxurious effect. Meanwhile, most of the established mainstream concerns also dipped their toes in the Art Deco water. 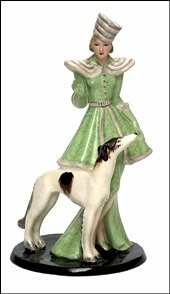 Royal Doulton produced a number of figures and some limited tableware. Wedgwood employed Keith Murray to produce his rather austere, but attractive monochrome annular wares, but Art Deco seems largely to have passed by Royal Worcester as a decorative concern. A Fieldings Crown Devon figure, circa 1935. Other smaller manufactories included Fieldings Crown Devon who produced some pretty figures and figural lamps and Poole Pottery, although their pastel coloured floral designs seem a little too traditional to me. Of course, a number of Continental factories produced top notch arty Art Deco, but not of the day to day proletariat type favoured by the British, although perhaps a special mention should be made for the delightful Robj figures. 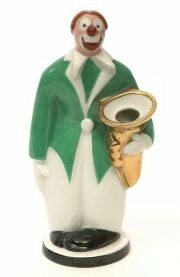 A French Art Deco figural decanter from Robj.